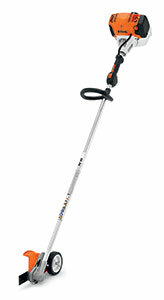 Stihl released a new line of three professional edgers: the Stihl FC 91, Stihl FC 96 and Stihl FC 111. With 710 cc fuel tanks and low-emission engines, these professional edgers provide 30 percent longer run times than their respective predecessors. The edgers feature a vertical pleated paper air filter for better filtration, extended replacement intervals and long service life. The line also features one-touch stop and a simplified starting procedure enabled by the semi-automatic choke lever. Additional features include an open deflector to minimize clogging, a mudflap style debris defector, unloaded overspeed protection to detect load changes and adjust engine speed to avoid possible engine damage and the IntelliCarb compensating carburetor.